In 1992, when I broke out on my own and started John Reinhardt Book Design, there were no blogs, Twitter, or Facebook to help share the news and allow book design fans and publishers to follow my adventures. 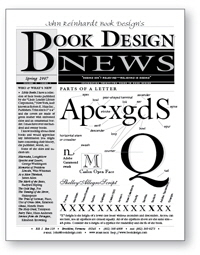 In an effort to document the changes technology was bringing to the book design world, and publishing industry, as well as have some fun with games, puzzles, and cartoons, I created the “Book Design News” newsletter. It was printed quarterly and mailed to more than 300 subscribers. My newsletter design was featured in an article titled "Award Winning Newsletter Design" in the August '94 issue of WINDOWS Magazine. So now, after a four year hiatus, I am excited to tell you that John Reinhardt’s Book Design News is back! Click on the image to the left to get your Fall 2009 issue. 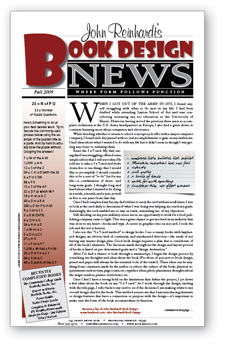 If you’d like to receive the newsletter by e-mail, just let me know. Go to my archive of past issues, good for lots of laughs and amusement.